On November 6, 2016 at the Boston Public Library four historians discussed Obama's legacy. Perhaps no president came into office with greater challenges or higher expectations than Barack Obama. Where will future presidential historians rank our first African-American president? For what will he be best remembered? Panelists: Ellen Fitzpatrick, political historian at the University of New Hampshire; Annette Gordon-Reed, historian and law professor at Harvard University; David Greenberg, journalist and historian at Rutgers University; Heather Cox Richards, Professor of American History at Boston College; Moderated by Meghna Chakrabarti host of WBUR's Radio Boston. On November 1, 2015 an outstanding group of scholars gathered to discuss citizenship, justice, and racial conciliation. Three experts, including Danielle Allen, James Forman, Jr., and Tommie Shelby offered their insights about moving toward national conciliation, moderated by Douglas Blackmon. This free public forum was held at the Edward M. Kennedy Institute for the United States Senate in Boston, MA. A special forum, temporarily replacing our annual fall symposium, held at the John F. Kennedy Presidential Library & Museum. The forum marked the 50th anniversary of the passage of the Civil Rights Act of 1964 and the 40th anniversary of the legal proceedings that led to court-ordered busing to desegregate Boston Public Schools. Created Equal: Striving toward Justice for All was a moderated discussion between former Congressman Barney Frank, former Chief Justice of the Massachusetts Supreme Judicial Court Margaret Marshall, Rutgers Law Professor David Dante Troutt, and editor and publisher of The Nation magazine Katrina vanden Heuvel. The panel was deftly moderated by Todd Purdum, national editor of Vanity Fair. 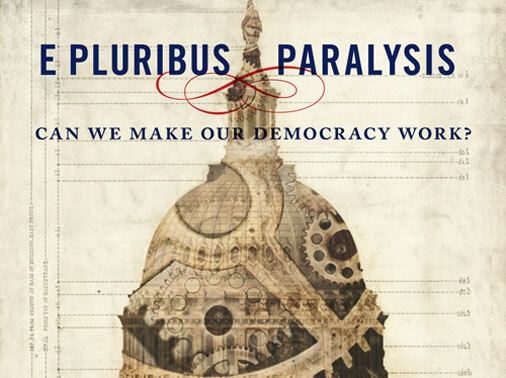 E Pluribus Paralysis: Can We Make Our Democracy Work? Mass Humanities' annual symposium held on November 3, 2012 in the Heights Room, Corcoran Commons at Boston College explores economic, political, social, and public policy aspects of economic inequality in the U.S.
Andrew Delbanco, Heather Beth Johnson, Barry O'Connell, Rhonda Cobham-Sander (moderator) Session III: What, If Anything, Should Be Done? Mass Humanities' annual symposium held on November 19, 2011 in Robsham Theater at Boston College explores the political, social, and cultural impacts of the Internet on democracy. Mass Humanities Fall symposium focusing on military and civic culture held on November 7, 2009 at Boston College. Listen, watch or read the three sessions. Mass Humanities' annual symposium held on November 22nd, 2008 in the Robsham Theater at Boston College. Seven big-time editors and reporters, one celebrated blogger, and a former presidential press secretary met on the stage of Robsham Theater to consider the latest puzzles, annoyances, and threats facing the mainstream media. Mass Humanities' annual symposium held on December 4, 2010 in the Heights Room in Corcoran Commons at Boston College. What made/makes America exceptional? Is America in decline? What does that mean exactly? Relative to what/whom? What are the major causes of decline? Which of these are within our power to correct? Is decline inevitable? How have other empires dealt with decline? What are our unique strengths? Can America rise again? How?